Hi Andy, sorry I disagree, the doubler ends against F3 not alongside. Danny's right - my mistake. The plan is correct! Just had a little Google K5674 has B/W suares ( colour pic ) and another mnus No in B/W pic appears to be the same but silver in B/W is hard to tell in grey scale. 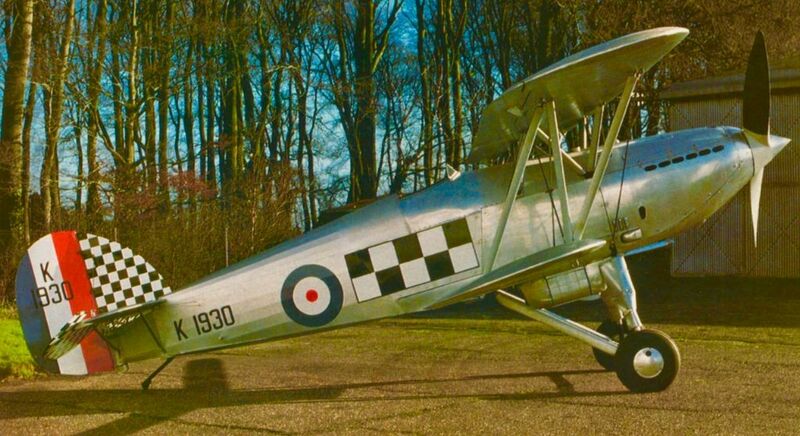 Not spent long on it but I Googled Kestrel biplane squadron markings.. There seems to be more on the page if anyone cares to look. 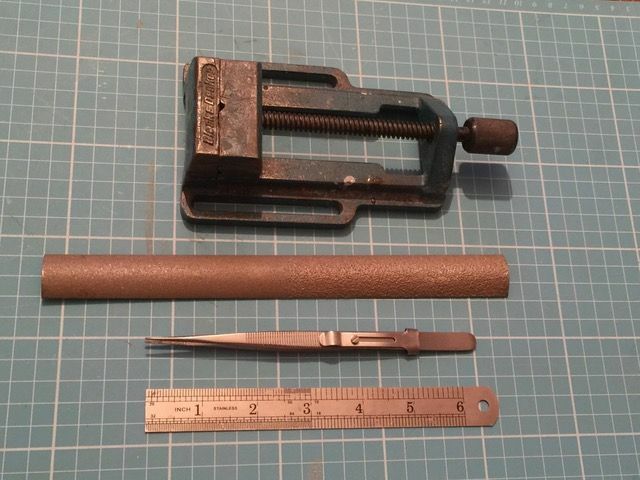 From the top, a Black and Dekker machine vice, a curved sanding tool from Perma-Grit (this one has two grades on one tool. They've stopped doing that so you now have to buy two tools to get the same functions. 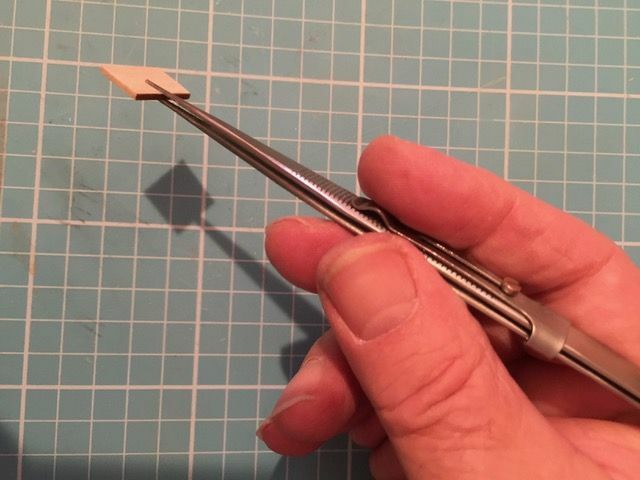 Notwithstanding, they come highly recommended), jewellers tweezers (more on that later), and a 6" steel ruler (the 24" version was getting a bit cumbersome! 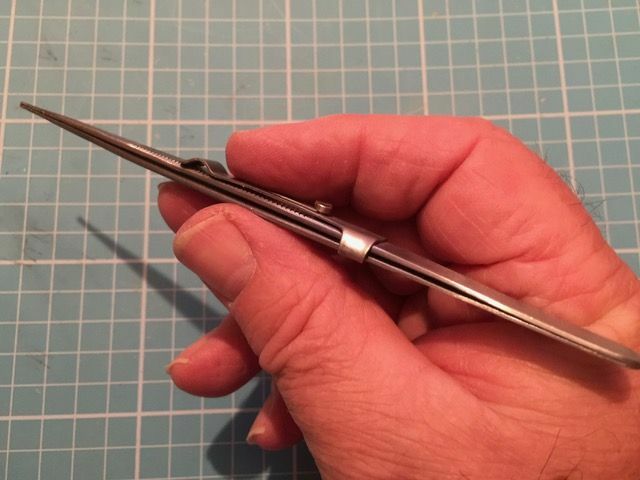 I was introduced to jewellers tweezers when buying a ring for the wife. The designer picked up the stones with one of these and handed them to us to look at. There's a rather neat locking device that can be actuated by the forefinger or thumb to lock or unlock the tweezers jaws. 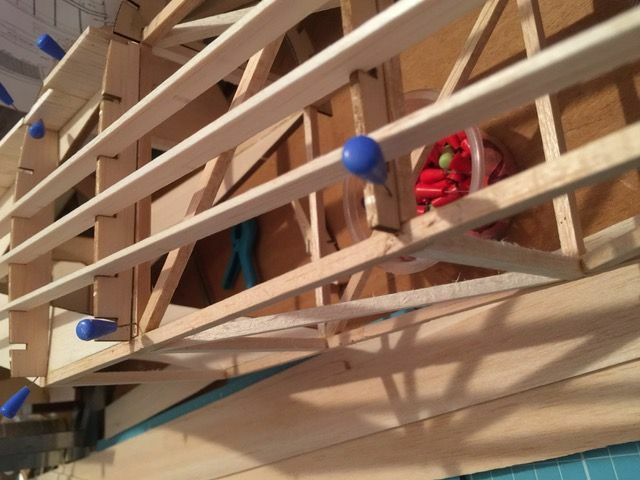 With their one-handed operation and soft grip, I find them ideal for small balsa parts ... on this model, I used them to apply adhesive to, and position, the riblets in the tailplane. 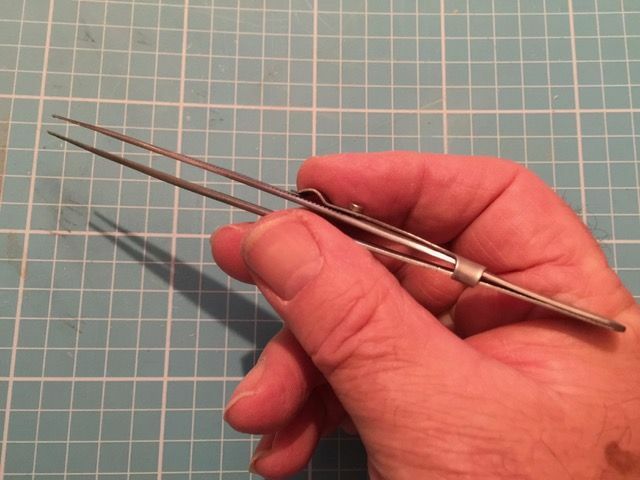 If you google 'Jewellers locking tweezers' you should find them for less than £4.00 a pair on the net. And I've procured a 14oz tank from SLEC that fits the tank bay perfectly! 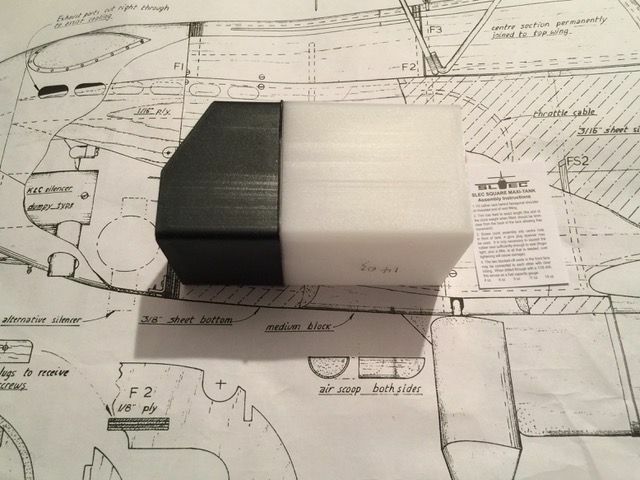 I've been trying to figure out how the fuselage formers go together and kept coming up with a blank, so the next step was to try a dry fit. Next job with be to dis-assemble the dry fit and put it back together with some adhesive..... Watch this space for more updates. Looking at those pics then Andy, you just removed wood from the inside of the side formers? All the formers are as per plan Danny - I've not modified any of them yet. However, I have made the 1/8" plate a bit oversize, so it may cover up any errors in the side formers. I'll have a better idea once I've glued to all together. 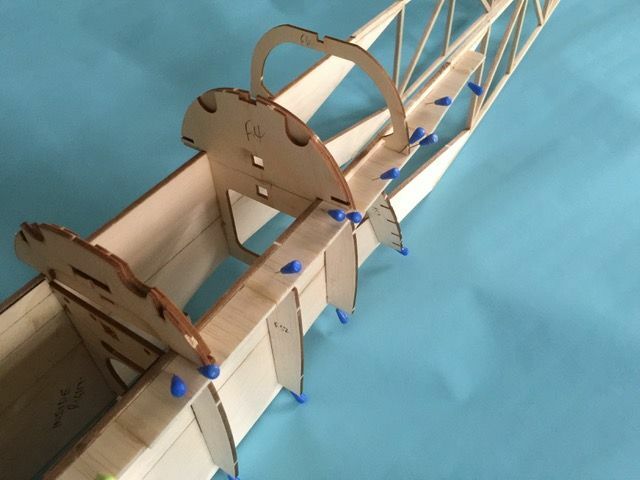 I've been plodding along slowly with the fuselage and lower wing since the last post. The next few posts should bring the build up to date. 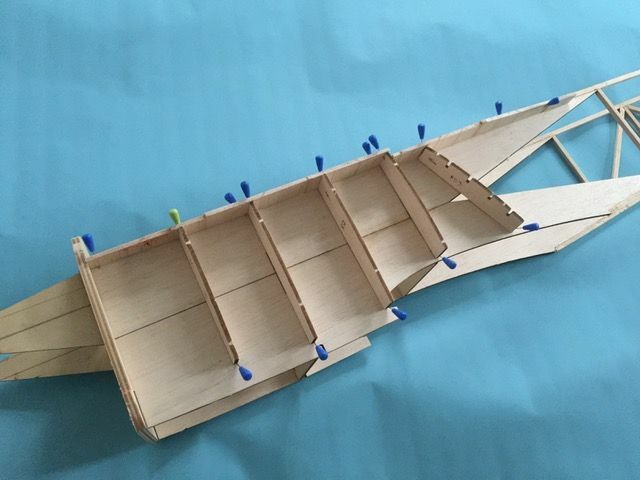 The lower side plate has been added to the front of the left fuselage and side formers added at the rear. The latter were helped in place with dry-fitted stringers. The slots appear to line up quite nicely, but the formers are a little over-long. They should stop level with the top of the bottom longeron. They'll be trimmed once dry. 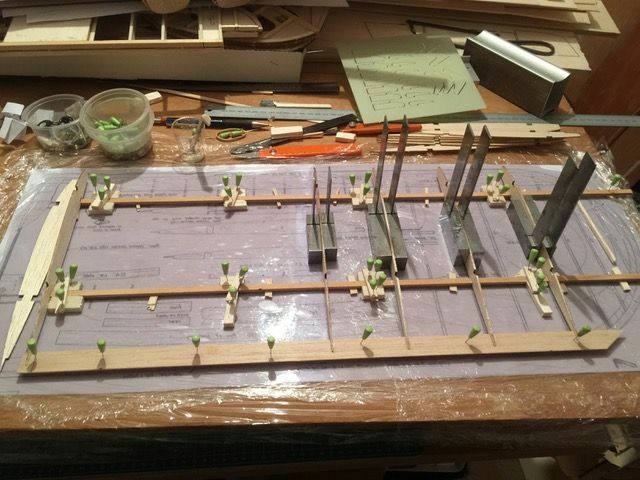 I've since added the side formers and side plates to the right side of the fuselage, but there are no pictures as yet. 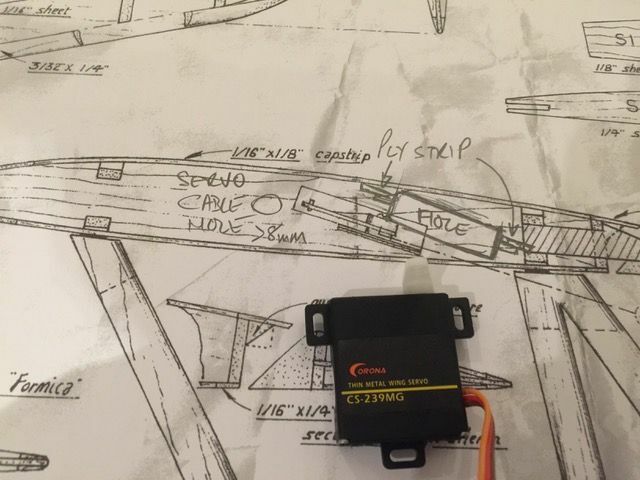 I'm delaying adding the side plate around the wing mount until the wing centre section has been constructed to give me a pattern - thanks to Danny for that advice! 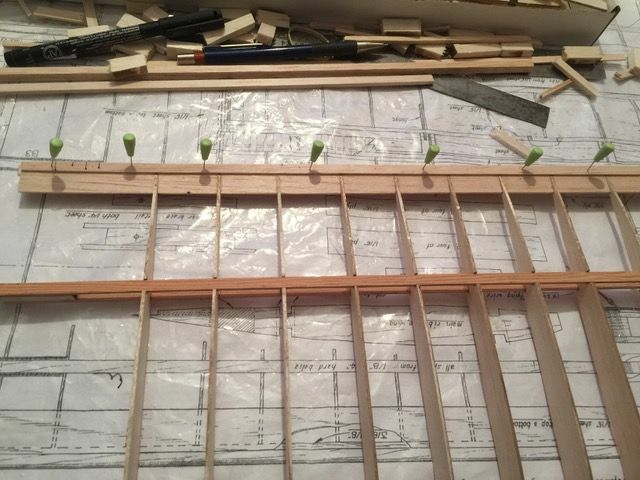 Looking at the rib cross-section, I decided to block up the spars with 1/8" balsa and the trailing edge plate and wing tip with 1/4" balsa. This appeared to work, but the trailing edge required two lengths of 1/4" square to support it properly. On the first letdown, I pinned through the spars. Danny, quite rightly threw his hands up in horror, so I scrapped those and supported the next attempt with 1/4: balsa each side. 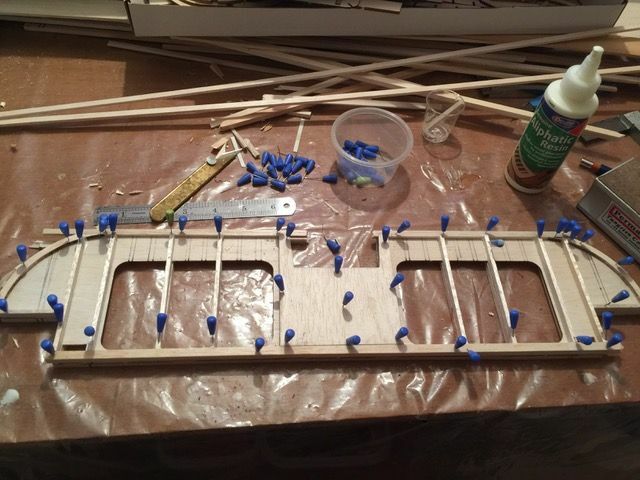 I laid down the rear spar first using a straightedge to ensure it was straight, then used the ribs to set the position of the front spar. 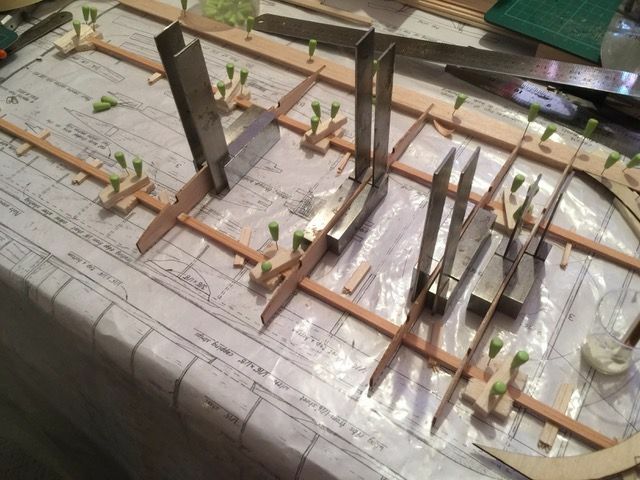 Ribs were then added four at a time (I only have 8 engineers squares) using squares to ensure they were upright. 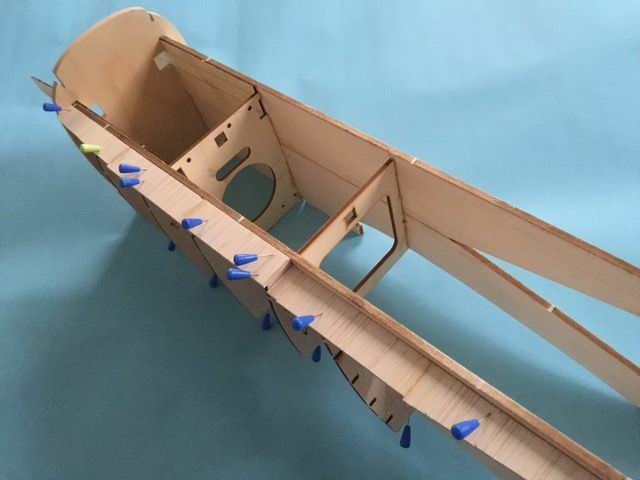 Following the addition of the main ribs, the wing tips were added and when the whole was dry, the upper trailing edge 1/4" x 1/8" strip glued in place. I left the wing to dry for a couple of days, then removed it from the plan, added the first leading edge strip and the lower TE strip. 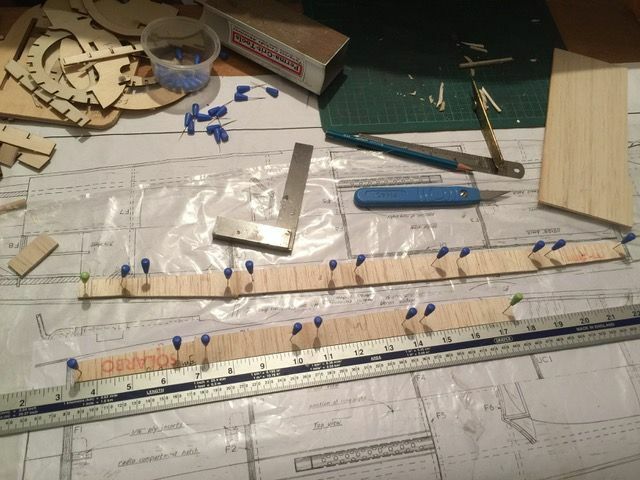 I used a strip of 1/4" sq balsa inner the wing when pinning the last LE strip in place over a flat board to ensure a straight TE. 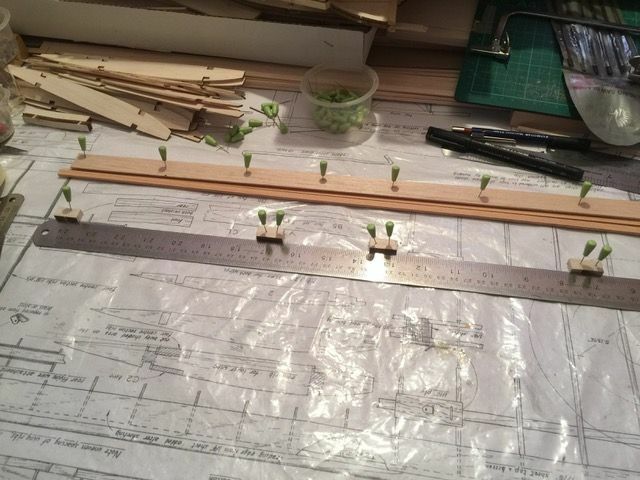 My only deviation form he plan so far is to use spruce spars. The wing has turned out quite flat, so I'm still 'on the fence' in respect of spar webs. Note that the two root ribs are yet to be fitted (as are the three tip ribs). The latter will happen in due course, but the former will need the dihedral webs to be fitted which I'll do when I build the centre-section after completing the starboard wing. I started to lay this one down this afternoon, but realised that I'd not planned the servo position - I'm using a separate servo in each wing. Danny also reminded me that I'll need servo lead holes in the ribs, which is another good call on his part! 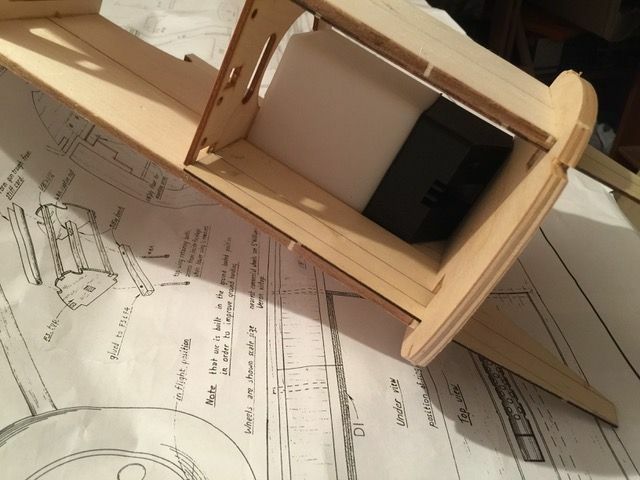 I'll be mounting the servos on two ply strips that run between three ribs. Great progress Andy, nice neat building too. So you are going to present the aileron pushrod as a direct replacement for the bellcrank output? I will probably do likewise. It is tempting to replicate the disc, but that is perhaps more trouble than it is worth. Are you going for detail again Danny.....it'll never catch on, mate! Yes, I'm planning to replace the bell crank with a servo. But having thought further, it doesn't need to be tilted. I can achieve the same result by off-setting the output arm on the servo shaft...doh! The next iteration should show a horizontal servo. I need to complete the centre-section of the lower wing in order to get the fuselage moving, the latter is waiting for the wing seat to be added. And in order to make up the centre-section, I need the second lower wing panel. The plan only shows one wing panel, so we need to build on the back of the plan for the opposite wing. Back in the day, AeroModeller used to recommend rubbing the plan with paraffin to make it transparent. With none of that in the garage, I use cooking oil or something similar. As this tends to ruin the original plan I make a photocopy that I can later throw away - I have a Brother A3 scanner/printer that will do A3 copies, and also enlarge and/or reduce them, which is very handy for a scale modeller! 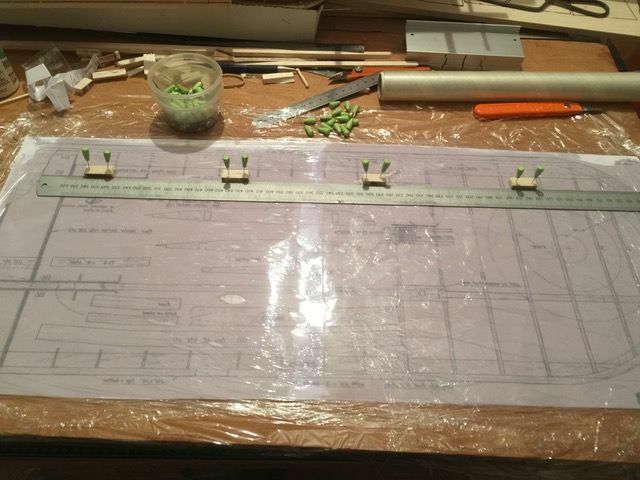 So, my technique is: copy the plan, tape the copies together to make one wing panel, cover the building board with cling film to protect it from the oil, lay the plan rear face uppermost on the cling film, rub the relevant parts with oil to make them show through, cover the result with cling film, them construct the wing. I start by laying a straight edge over the spar position and add blocks on one side. I then add the spar and use blocks the other side to hold it in place. The position of the second spar and TE can be set using wing ribs to get the required distances. When adding ribs, I use engineers squares to keep them all upright, so I can only add four at a time. I use to do that by eye, but since I now wear various-focal lenses, trying to assess anything by eye is a nightmare!!! Anyway, progress has been steady and the lower photo shows the result after adding the TE strip and the wing tip this morning. 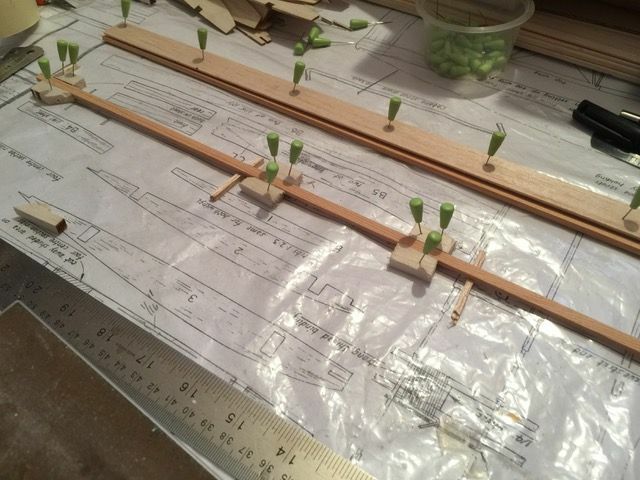 For info, the spars have been jigged off the plan with 1/8" scrap, and the TE and wing tip using 1/4" scrap. 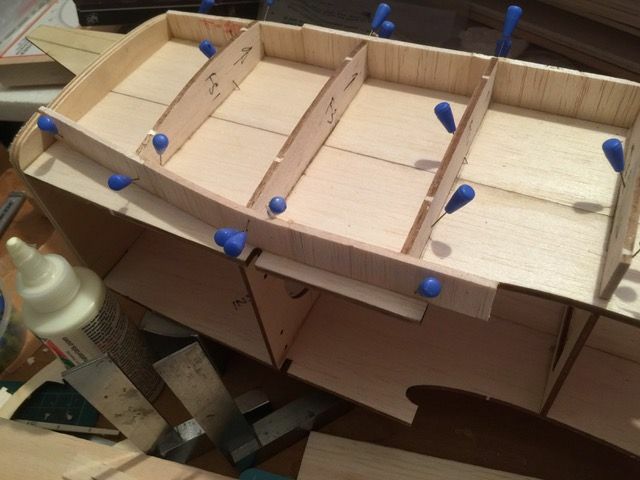 The 2 root ribs require the dihedral braces to be fitted first, so they will wait until the centre-section is constructed. Thanks Martyn. 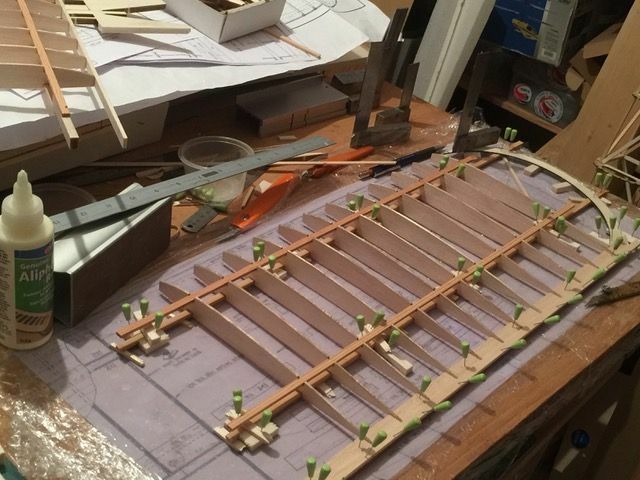 I'm leaving the tip ribs for the mo as the priority for me is the lower wing centre-section so I can progress the fuselage. I'll post when I've had a better look at them and come up with a solution. If you have grand kids or even older offspring Lego comes beautifully accurate square and can be built to suit application. And they might not miss a few pieces. 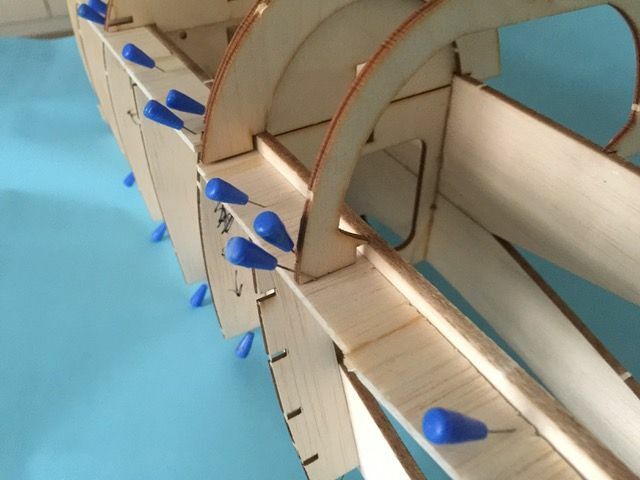 Nice idea with using scraps of balsa as clamps, maygive that a go, likely to use servos in wing aswell. Andy, I found with the Chipmunk that rubbing the plan with meths made it transparent without shrinking the paper and leaves it completely dry. It lasts that way as well.